Classical texts on Hatha Yoga such as Hathayoga Pradipika give too much importance to Pranayama or the control of vital life energy. An important aspect of Pranayama is breath retention or Kumbhaka. Hatha Yoga recommends its practitioners that the duration of Kumbhaka is to be gradually increased. This gradual increase of Kumbhaka ultimately results in what is known as Kevala Kumbhaka or Kevali or spontaneous breath retention. The spontaneous breath retention may sound impossible or a far stretched story for many who haven't been trained in this style of Yoga. However, many seasoned practitioners of Hatha Yoga have experienced a "breathless state" or at least a state quite close to it. Why do Hatha Yoga gives so much importance to Kevala Kumbhaka? That's because breath and thoughts are closely connected. Sacred texts of Hatha Yoga mention that when breath is controlled the thoughts are subdued. Similarly, when the mind is calm and quite the breathing too is slow and rhythmic. Hatha Yoga considers breath and mind as the two sides of the same coin. You control one the other comes under control. Since they are interconnected stopping one also stops the other. Thus when breathing stops completely (Kevala Kumbhaka) even the thoughts stop completely and the Yogi experiences Samadhi. This explains the great emphasis attributed to Pranayama and Kumbhaka. Now the question is - Can a practitioner of Ajapa attain the Kevala Kumbhaka? Since Ajapa uses the normal breathing pattern to develop meditative states how the breathless state can be experienced? The answer to the first question is sounding YES. A practitioner of Ajapa too can attain the state of Kevala Kumbhaka. As a part of Ajapa Sadhana you are basically observing your natural breathing. As your practice matures you will find that the number of inhalations and exhalations per minute have been reduced. As your practice matures further you will notice a mystical pause between two breathing cycles. Ordinarily breathing cycle continues like this: inhale - exhale - inhale - exhale - inhale and so on. Under normal circumstances you can't notice any break or pause between the two. As the breathing rate slows down, however, you start clearly noticing a small pause between inhalation and exhalation. Thus your breathing cycle becomes: inhale - pause - exhale - pause - inhale - pause - exhale - pause and so on. Did you willfully added this pause? No. It developed spontaneously and effortlessly. This is Kevala Kumbhaka! During the initial stages this pause between inhalations and exhalations will be very small. Just a tiny gap. As your practice matures further you may experience increase in this gap. One day you may even experience the full Kevala Kumbhaka leading to Samadhi. This tiny gap is the seed of self-realization. That's where your practice starts giving you various mystical and secret experiences. Of course, these experiences are just indications that your practice is working in the right direction. 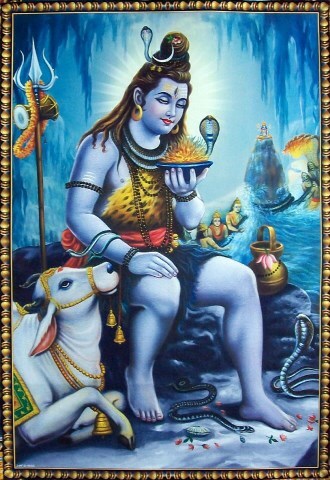 Your journey ends only when you become one with Shiva! Some practitioners complain that their inhale-exhale cycles never slows down. And they can't observe any reduction in their breathing rate. This usually happens because rather than your mind following your breath your breath is following the mind. Try to understand this difference carefully. This is important. Seek guidance from your Guru if you can't correct this mistake.